Background: Inflammation in the central nervous system, resulting from a loss of control involving a network of neuronal cells, is foremost contributors to the instigation and advancement of major neurodegenerative diseases. Therefore, therapeutic strategies should restore back to a well-controlled and finely-tuned balance of immune reactions, and protect neurons from inflammatory damage. Objective: The objective of this study is to evaluate the anti-neuroinflammatory potential of Capsaicin in lipopolysaccharide (LPS)-stimulated BV-2 microglial cells. Materials and Methods: In this present study, we selected Capsaicin and investigated through cell-based-assay systems through the various cellular techniques enzyme-linked immunosorbent, immunoblot and immunofluorescence assays to identify anti-inflammatory effects. Results: We found that capsaicin exhibited highly anti-inflammatory and neuroprotective effects in cell culture experiments, reduced nitric oxide, tumor necrosis factor-α, interleukin-1 β, and interleukin expression from activated BV-2 microglia cells dose-dependently. On the intracellular level, capsaicin inhibited IκB-phosphorylation and subsequently nuclear Factor-κB (NF-κB)-translocation in microglia cells. Further, capsaicin blocked the protein expressions of inducible nitric oxide synthase and cyclooxygenase-2. Further, capsaicin inhibits the increased production of pro-inflammatory responses in LPS-stimulated BV-2 cells by suppressing NF-κB activation. Conclusion: The significant inhibition of neuroinflammatory responses in stimulated microglial cells together indicate that capsaicin is a potential therapeutic agent and could possibly be used in the development of novel drug for the prevention and treatment of neuroinflammatory diseases. Capsaicin, a bioactive compound effectively inhibits the increased production of numerous pro-inflammatory mediators and suppresses the expression of NF-κB signaling targets in lipopolysaccharide-stimulated BV-2 cells. Inflammation is an adaptive physiological response induced by exterior challenge or cellular injury that leads to the release of a complex array of inflammatory moderators to restore tissue structure and functions. Withal, protracted inflammation can be detrimental, contributing to the pathogenesis of many diseases such as cancer, diabetes, arthritis, and atherosclerosis. The term “neuroinflammation” has gained immense attention in recent years after it has been implicated in chronic unremitting neurodegenerative diseases such as Alzheimer's, Parkinson's disease, and multiple sclerosis. All the neurological afflictions from traumatic brain injuries and nervous system infections to chronic neurodegenerative diseases are implicated with neuroinflammations. This new understanding has come from rapid advances in the field of glial, immune cells resident of the central nervous system (CNS). In the midst of the discrete cell types associated with inflammation-mediated neurodegeneration, microglia have been implicated as vital components of the immunological insult to neurons. Microglia occupies approximately 12% of cell population in the CNS, and it is defined as cerebral macrophages. They are brain-specific macrophages that provide healthy tissue, trophic support, and maintains homeostasis of the CNS. The brain can be insulted by a variety of factors, including inflammation, excitotoxicity, and oxidative stress. In the event of brain damage, microglia cells acting as a first-line defense in neuronal injury, undergo dramatic morphological changes from resting ramified cells to activated amoeboid microglia. Under these conditions, activated microglia secrete various neurotoxic and excess pro-inflammatory mediators including prostaglandin E2, nitric oxide (NO), interleukin-(IL-6), IL-1β, tumor necrosis factor-α (TNF-α), and superoxide anions causing demyelination and subsequent neurodegeneration. Therefore, modulation of neuroinflammation corollary may delay or halt neurodegenerative disease progression before irreversible damage and clinical symptoms occur. Chili peppers (Capsicum), is one of the most commonly used spices in the world as additives in cooking because of their unique pungency, aroma, and color. Capsaicin (8-methyl-N-vanillyl-6-nonenamide), is the active compound and a type of alkaloid found primarily in hot chili pepper, which is responsible for their characteristic taste. Large consumption of capsaicin known to promote pain relief and these properties attracts the attention of researchers to study the pain-related events using capsaicin. Recent progress indicates that the headway of neuroinflammation which is accountable for engendering and nourishing the sensitization of nociceptive neurons leads to chronic pain. This opens the door to potentially exciting therapeutic and diagnostic advances of capsaicin in the field of neurological disorders. It also points to a paradigm shift in focusing on brain abnormalities in relation to chronic pain. To the best of our knowledge, no previous reports have described the anti-inflammatory activity of capsaicin. Hence, in this study, we sought to determine whether capsaicin possesses anti-neuro-inflammatory activity in lipopolysaccharide (LPS)-stimulated BV-2 microglial cells. Murine BV-2 microglial cells (ATCC, USA) were maintained in DMEM supplemented with 10% FBS, penicillin and streptomycin sulfate (1%) in a humidified atmosphere of 5% CO2. Cells pretreated with various concentrations of capsaicin (Sigma-Aldrich, St. Louis, USA) for 2 h were stimulated with LPS (1 μg/mL) (Sigma-Aldrich, St. Louis, USA) for the indicated times. Cell viability was determined by 3-(4, 5-dimethylthiazo l-2-yl)-2,5-diphenyl-tetrazolium bromide (MTT) assay (Sigma-Aldrich, St. Louis, USA). Cells were inoculated at a density of 1 × 104 cells into 96-well plates and cultured at 37°C for 24 h. Cells were then treated in the presence or absence of capsaicin at various concentrations for 24 h. 5 μL of MTT was added to each well then incubated for additional 4 h in the dark at 37°C. The medium was then aspirated from the wells and the purple formazan product obtained was dissolved in dimethyl sulfoxide (Sigma-Aldrich, St. Louis, USA). The plates were analyzed at 570 nm using a microplate reader. The production of NO was assayed by measuring the levels of nitrite in the culture supernatant using colorimetric assay with Griess reagent. Briefly, BV-2 cells (1 × 106 cells/ml) were seeded in 6-well plates in 2 mL complete culture medium and incubated for 24 h, at 37°C. This followed by replacing the old culture media with the different concentrations of capsaicin and then stimulated with LPS (1 μg/ml) after 2 h. 100 μL of culture supernatant reacted with an equal volume of Griess reagent (0.1% naphthylethylenediamine and 1% sulfanilamide in 5% H3 PO4) in 96 well plates at room temperature in the dark for 10 min. Nitrite concentrations in the culture supernatant were determined by using standard solutions of sodium nitrite (Sigma-Aldrich, St. Louis, USA). The absorbance was read at 540 nm using a microplate reader. Cells (1 × 106 cells/well) were pretreated with capsaicin for 2 h before LPS treatment for 24 h. After treatment with LPS, culture media were collected. Levels of TNF-α, IL-1 β, and IL-6 (R and D systems, USA) in culture media from the treatment were quantitatively determined by enzyme-linked immunosorbent assay according to the manufacturer's instructions. BV-2 cells were seeded in a chamber slide at the concentration of 5 × 103 and allowed to plate overnight. Next, the cells were treated with capsaicin 2 h before LPS treatment for 24 h. Furthermore, the cells were treated with LPS (1 μg/mL); then, the slides were washed with ice-cold phosphate-buffered saline (PBS), and the cells were fixed with ice-cold methanol: acetone for 20 min at −20°C (1:1). The slides were then blocked with 5% BSA in Tris-buffered saline-Tween-20 for 90 min. The sections were then immunostained with mouse monoclonal immunoglobulin G to mouse p65-nuclear factor-κB (NF-κB) (Abcam, USA), diluted 1:200 with 5% BSA in TBS, and incubated overnight at 4°C. After washing the sections three times with TBS, the slides were incubated with their corresponding secondary antibodies, DyLight™ 550 (Thermo Scientific, MA, USA), diluted 1:500 with TBS, and incubated in the dark for 60 min at room temperature. The sections were then washed with TBS and incubated with counterstain Hoechst to stain the cell nuclei. The slides were coverslipped and visualized under an Olympus FS X100 fluorescent microscope (Tokyo, Japan). After all the treatments, the BV-2 cells washed in PBS and resuspended in 1 ml of solution A (250 mM sucrose, 1.5 mM MgCl2, 20 mM HEPES, 10 mM KCl, 1 mM EDTA, pH 8.0, 1 mM EGTA and 1× protease inhibitor cocktail; ~300 mOsm) with gently tapping and pipetting. Then the samples were homogenized, and the lysates were centrifuged at 720 g for 8 min at 4°C. The supernatant (cytosolic fraction) was transferred into a new 1.5 ml tube and the remaining cell pellets were washed twice with 0.5 ml solution A, and resuspended in 50 μl of solution B (20 mM HEPES, pH 7.9, 420 mM NaCl, 1.5 mM MgCl2, 0.2 mM EDTA, pH 8.0, 0.5 mM PMSF, 0.5 mM DTT, 25% glycerol, and 1x protease inhibitor cocktail; ~3860 mOsm). Samples were kept on ice for 1 h and centrifuged at 9300 g for 10 min at 4°C. The supernatant for nuclear fraction was taken and kept at −80°C until use. Cells obtained from treatment were washed twice with cold PBS and lysed using RIPA buffer for immunoblot analyses. Cell lysates were normalized for protein content using BCA reagent. An equal amount of cellular proteins was loaded on 10% sodium dodecyl sulfate–polyacrylamide gel electrophoresis under reducing conditions for separation. The separated protein was then transferred to polyvinylidene difluoride (PVDF; GE Healthcare) membranes for 1 h. The membrane undergoes washing with PBS Tween-20, followed by blocking step for minimum 1 h with blocking solution (5% of BSA in PBS containing 1% Tween-20 [PBST]) at room temperature. Membranes were incubated overnight with specific primary antibodies of p65-NF-κB, p-p65-NF-κB, p-IκB-α (Cell Signaling Technology, USA), inducible nitric oxide synthase (iNOS), COX-2, and β-actin (Santa Cruz Biotechnology, USA) at 4°C overnight. The membrane was the then exposed to secondary antibodies (Santa Cruz Biotechnology, USA) coupled to horseradish peroxidase for 2 h and washed PBST. The bands were visualized using chemiluminescence system (Chemi Doc, Bio-Rad, USA) and the bands followed by analyzed using ImageJ software (NIH, USA). Data were expressed as means ± standard deviation of at least three independent experiments unless otherwise indicated. The data were processed by the statistical analysis software SPSS version 16.0 (SPSS Inc., Chicago, IL, USA). Hypothesis testing methods included one-way analysis of variance followed by the least significant difference test; P < 0.05 was considered to indicate statistical significance. To determine the cytotoxic effects and effective dose of capsaicin, BV-2 microglial cells were treated with increasing concentrations (25–500 μg/mL) for 24 h, and the cell viability was quantified by the conversion of yellow MTT into formazan crystals by MTT assay. Cell viability remained above 90% as determined by the MTT assay; thus, no significant cytotoxicity was observed up to 500 μg/mL [Figure 1]. Based on these preliminary data, minimum nontoxic doses, i.e., 5 and 100 μg/ml were used for all subsequent assays. In addition, the concentration of LPS (1 μg/ml) used to induce inflammation. The low-dose anti-inflammatory potency of capsaicin on the production of NO in BV-2 cell was studied by pretreating BV-2 cells with Capsaicin for 2 h before LPS stimulation for 24 h. In BV-2 cells, LPS markedly induced NO production as detected by the accumulation of nitrite in the culture medium after 24 h. In the presence of capsaicin, however, there was a dose-dependent inhibition of NO production to almost control levels at the highest concentration of Capsaicin, 100 μg/mL. These effects of Capsaicin were not due to cytotoxicity since capsaicin at these concentrations did not show any significant reduction in cell viability [Figure 2]. The suppression of pro-inflammatory cytokines such as TNF-α, IL-6, and IL-1 β by capsaicin in BV-2 cells was investigated. For this study, capsaicin pre-incubated BV-2 microglia were challenged with LPS for 24 h, and the cytokine levels in the culture supernatants were evaluated. As indicated in [Figure 3]a-c, the production of TNF-α, IL-6, and IL-1 β induced by LPS treatment was significantly decreased by the treatment with capsaicin in a dose-dependent manner, further justifying the anti-inflammatory activity of capsaicin in a cell system. The intracellular mechanism, potentially responsible for the inhibitory effects of capsaicin on iNOS, COX-2, and p65-NF-κB was examined by quantitative protein expression. As shown in [Figure 4]a, LPS markedly increased the phosphorylation of IκB-α and NF-κB p65 subunit compared with those in nonstimulated BV-2 cells suggesting the activation of p65-NF-κB. However, the pretreatment with capsaicin effectively reduced the expression of p-IκB-α and NF-κB p65 in LPS-stimulated BV-2 cells. We wanted to check the expression of both NF-κB and phosphorylated NF-κB in the nuclear fraction of BV-2 cells treated with LPS and Capsaicin [Figure 4]c. It was observed that the expressions of both p65-NF-κB and p-p65-NF-κB were increased in LPS-induced BV-2 cells. In contrast, capsaicin dose-dependently decreased the expressions of p65-NF-κB and p-p65-NF-κB. Further, we analyzed the effect of capsaicin on the localization of p65-NF-κB in LPS-induced BV-2 cells [Figure 4]b. It was noted that LPS administration resulted in the nuclear accumulation of p65-NF-κB. In contrast, capsaicin at dose-dependently reduced the nuclear translocation of p65-NF-κB. Since the expressions, pro-inflammatory mediators are known to be modulated by NF-κB, inhibition of iNOS, and COX-2 protein expression was evidenced in parallel to the suppression of NF-κB by capsaicin in dose-dependent manner. One of the perilous players in brain inflammation is the uncontrolled activation of microglia which is dispersed ubiquitously in the neuronal system, and that contributes to neuro-inflammatory-mediated neuro-degeneration. Elevated release and activation of microglial is the starting point for a wide array of potentially neurotoxic molecules including pro-inflammatory cytokines and neurotoxic reactive oxygen species. It is decisive to prevent the activation of the microglial cells so that various neuroinflammatory diseases can be prevented. Many lines of evidence have indicated that in the culture system, microglial cells can be stimulated by LPS, triggering the production of inflammatory mediators and cytokines. Therefore, LPS-induced inflammatory mediators in vitro were one of the key tools to evaluate anti-neuroinflammatory agents. Numerous studies demonstrated that LPS-activated microglial cells can be effectively prevented by bioactive compounds that have been isolated from natural resources.,, Thus, the present study was due to the anti-inflammatory potential the capsaicin protects the murine BV-2 microglial cells from the LPS. Intercession in molecular mechanism of inflammatory microglia activation is measured to be a very hopeful therapeutic strategy for treating neurodegenerative disease. The major extracellular signal transduction pathway stimulated by inflammatory mediators is NF-κB. In most cell types, NF-κB sited in the cytosol as an inactive complex bound to inhibitory kappa B (IκB) family and is activated by diverse external stimuli including inflammatory cytokines; bacterial components (LPS), and viral infection. LPS stimulates the phosphorylation, ubiquitination, and proteasomal degradation of IκB, resulting in the translocation of p65-NF-κB into the nucleus by dissociation of the NF-κB–IκB-α complex and subsequently assists the transcription of several genes involved in inflammation, such as COX-2 and iNOS. Stimulated microglial cells also secrete TNF-α and interleukins. We demonstrated in this study that Capsaicin inhibited LPS-induced NO release, iNOS, COX-2, TNF-α, IL-1 β, and IL-6 expression and that the anti-inflammatory effects of Capsaicin were exerted by the regulation of NF-κB signaling pathways. One of the most toxic substances released in large quantities by activated microglial cells is NO. NO is mainly produced by enzymatic action of iNOS and cautiously regulated to maintain homeostasis. Many studies have revealed that peculiarly high levels of NO are found in numerous types of brain injuries and neurodegenerative diseases under the influence by enhanced expression of iNOS., Treatment with inhibitors of iNOS marks in neuroprotection against LPS-induced neurotoxicity, signifying that NO is an imperative arbitrator in neurotoxicity. Our findings indicated that capsaicin inhibits the production of NO in LPS-stimulated BV-2 cells. Other molecules that are secreted by stimulated microglial cells include TNF-α and interleukins, both of which can cause neuronal cell death both directly and indirectly via the induction of NO. In agreement with the previous reports on microglial activation, we observed that pro-inflammatory cytokines such as TNF-α, IL-1 β, and IL-6 were enhanced by LPS-stimulation in BV-2 microglial cells. Withal, capsaicin inhibited the LPS-stimulated increase of the pro-inflammatory cytokines TNF-α, IL-1 β and IL-6. According to the study of Amor et al., similar results regarding the anti-inflammatory action of Capsaicin were shown. These results suggested that capsaicin may have a protective effect against the neuroinflammatory response in neurodegenerative diseases. The key inflammatory signaling mediator NF-κB was known to be involved in neuroinflammation. The promoters of the inflammatory transcription genes iNOS and COX-2 contain NF-κB binding regions, and the expression of these enzymes can be regulated by the activation of NF-κB. We investigated the repressive effect of capsaicin on NF-κB activation in BV-2 cells. 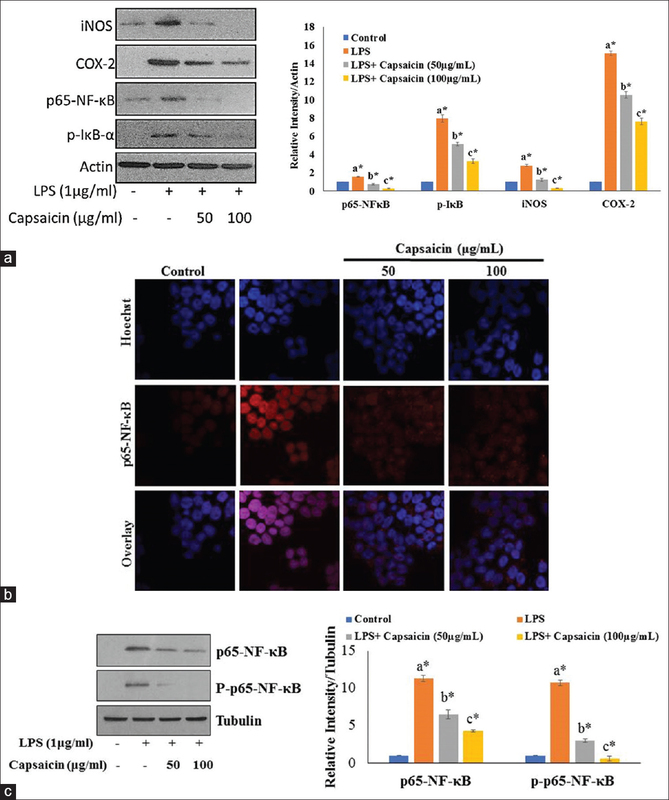 Capsaicin inhibited LPS-induced IκB-α phosphorylation and reversed LPS-mediated IκB-α degradation and translocation of the NF-κB p65 subunit, suggesting that transcriptional down-regulation of the iNOS, COX-2 and pro-inflammatory cytokines expression by capsaicin primarily results from inactivation of NF-κB in LPS-stimulated microglia cells. NF-κB thus appears to be an important target transcription factor mediating the anti-inflammatory effects of Capsaicin. Our study led to the identification of capsaicin as an inflammation-controlling, neuroprotective, and neurogenesis-promoting agent. However, further identification of the direct target molecules of capsaicin is required to support its use as an anti-neuro-inflammatory agent against the neurodegenerative disorders. Capsaicin, a bioactive compound inhibits the secretion of inflammatory mediators such as NO and pro-inflammatory cytokines, including TNF-α, IL-1 β, and IL-6, in LPS-stimulated BV-2 microglia. Furthermore, the inhibitory effect of capsaicin was allied with the inactivation of the NF-κB pathway through reduced IκB-α phosphorylation. However, the in vitro nature of our study limits conclusions regarding capsaicin effects on the in vivo neuro-inflammatory response. Further studies are required to investigate the anti-inflammatory and neuroprotective effects of capsaicin in animal models of neurodegenerative disease. The research work was supported by “Excellent Project of Beijing Municipal Science and Technology Fund (NO.Z171100001017227)”. Allison DJ, Ditor DS. Immune dysfunction and chronic inflammation following spinal cord injury. Spinal Cord 2015;53:14-8. Arulselvan P, Fard MT, Tan WS, Gothai S, Fakurazi S, Norhaizan ME, et al. Role of antioxidants and natural products in inflammation. Oxid Med Cell Longev 2016;2016:5276130. Streit WJ, Mrak RE, Griffin WS. Microglia and neuroinflammation: A pathological perspective. J Neuroinflammation 2004;1:14. Gupta M, Kaur G. Aqueous extract from the Withania somnifera leaves as a potential anti-neuroinflammatory agent: A mechanistic study. J Neuroinflammation 2016;13:193. Spandana RK, Sushruta K. Carum carvi Linn (Umbelliferae) attenuates lipopolysaccharide-induced neuroinflammatory responses via regulation of NF-κB signaling in BV-2 microglia. Trop J Pharm Res 2015;14:1041-7. Cao Q, Kaur C, Wu CY, Lu J, Ling EA. B regulates notch signaling in production of pro-inflammatory nuclear factor- cytokines and nitric oxide in murine BV-2 microglial cells. Neuroscience 2011;192:140-54. 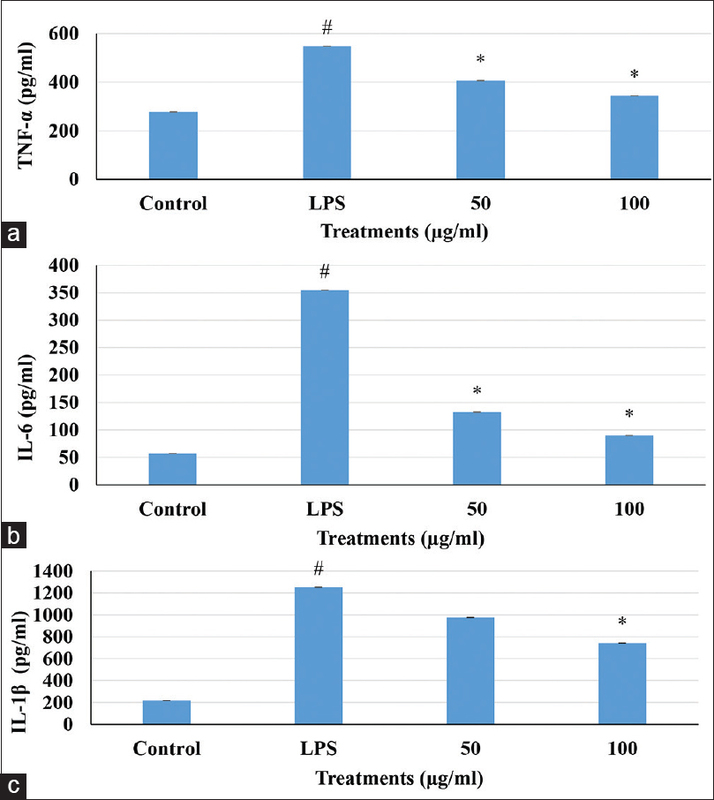 Harun A, Vidyadaran S, Lim SM, Cole AL, Ramasamy K. Malaysian endophytic fungal extracts-induced anti-inflammation in lipopolysaccharide-activated BV-2 microglia is associated with attenuation of NO production and, IL-6 and TNF-α expression. BMC Complement Altern Med 2015;15:166. Asanuma M, Nishibayashi-Asanuma S, Miyazaki I, Kohno M, Ogawa N. Neuroprotective effects of non-steroidal anti-inflammatory drugs by direct scavenging of nitric oxide radicals. J Neurochem 2001;76:1895-904. Choi DK, Koppula S, Suk K. Inhibitors of microglial neurotoxicity: Focus on natural products. Molecules 2011;16:1021-43. Chen LW, Wang YQ, Wei LC, Shi M, Chan YS. Chinese herbs and herbal extracts for neuroprotection of dopaminergic neurons and potential therapeutic treatment of Parkinson's disease. CNS Neurol Disord Drug Targets 2007;6:273-81. Arora R, Gill NS, Chauhan G, Rana AC. An overview about versatile molecule capsaicin. Int J Pharm Sci Drug Res 2011;3:280-6. Anand P, Bley K. Topical capsaicin for pain management: Therapeutic potential and mechanisms of action of the new high-concentration capsaicin 8% patch. Br J Anaesth 2011;107:490-502. Ji RR, Xu ZZ, Gao YJ. Emerging targets in neuroinflammation-driven chronic pain. Nat Rev Drug Discov 2014;13:533-48. Oh WJ, Jung U, Eom HS, Shin HJ, Park HR. Inhibition of lipopolysaccharide-induced proinflammatory responses by Buddleja officinalis extract in BV-2 microglial cells via negative regulation of NF-kB and ERK1/2 signaling. Molecules 2013;18:9195-206. Cho DY, Ko HM, Kim J, Kim BW, Yun YS, Park JI, et al. Scoparone inhibits LPS-simulated inflammatory response by suppressing IRF3 and ERK in BV-2 microglial cells. Molecules 2016;21. pii: E1718. Han MH, Lee WS, Nagappan A, Hong SH, Jung JH, Park C, et al. Flavonoids isolated from flowers of Lonicera japonica thunb. Inhibit inflammatory responses in BV2 microglial cells by suppressing TNF-α and IL-β through PI3K/Akt/NF-kb signaling pathways. Phytother Res 2016;30:1824-32. Luo Q, Yan X, Bobrovskaya L, Ji M, Yuan H, Lou H, et al. Anti-neuroinflammatory effects of grossamide from hemp seed via suppression of TLR-4-mediated NF-κB signaling pathways in lipopolysaccharide-stimulated BV2 microglia cells. Mol Cell Biochem 2017;428:129-37. Gilroy DW, Lawrence T, Perretti M, Rossi AG. Inflammatory resolution: New opportunities for drug discovery. Nat Rev Drug Discov 2004;3:401-16. Fitzgerald KA, Rowe DC, Barnes BJ, Caffrey DR, Visintin A, Latz E, et al. LPS-TLR4 signaling to IRF-3/7 and NF-kappaB involves the toll adapters TRAM and TRIF. J Exp Med 2003;198:1043-55. Majdalawieh A, Ro HS. Regulation of ikappaBalpha function and NF-kappaB signaling: AEBP1 is a novel proinflammatory mediator in macrophages. Mediators Inflamm 2010;2010:823821. Chang CF, Liao KC, Chen CH 2-phenylnaphthalene derivatives inhibit lipopolysaccharide-induced pro-inflammatory mediators by downregulating of MAPK/NF-κB pathways in RAW 264.7 macrophage cells. PLoS One 2017;12:e0168945. Liu B, Hong JS. Role of microglia in inflammation-mediated neurodegenerative diseases: Mechanisms and strategies for therapeutic intervention. J Pharmacol Exp Ther 2003;304:1-7. Sarmad AS, Hyeung-Rak K. Anti-inflammatory effect of an ethanolic extract of Myagropsis yendoi in lipopolysaccharide-stimulated BV-2 microglia cells. Fish Aquat Sci 2014;17:27-35. Oh YT, Lee JY, Lee J, Kim H, Yoon KS, Choe W, et al. Oleic acid reduces lipopolysaccharide-induced expression of iNOS and COX-2 in BV2 murine microglial cells: Possible involvement of reactive oxygen species, p38 MAPK, and IKK/NF-kappaB signaling pathways. Neurosci Lett 2009;464:93-7. Necela BM, Su W, Thompson EA. Toll-like receptor 4 mediates cross-talk between peroxisome proliferator-activated receptor gamma and nuclear factor-kappaB in macrophages. Immunology 2008;125:344-58. Amor S, Puentes F, Baker D, van der Valk P. Inflammation in neurodegenerative diseases. Immunology 2010;129:154-69. Morgan MJ, Liu ZG. Crosstalk of reactive oxygen species and NF-κB signaling. Cell Res 2011;21:103-15.